We left the Pembrokeshire coast looking for something a bit different to do while the rain continued to fall on us. We drove to our next wild camping spot a bit further inland, using winding roads that followed the course of the Teifi river. The river was running high, brown and churning from all of the recent wet weather. Near to Cenarth we found a forestry commission spot up a steep track in the woods and made ourselves as level as possible so that we could get set up and then pop out for a bike ride. But our plans had to change when we found our gas supplies were running low. Possibly this was a blessing as the afternoon showers ended up merging into each other and it would have been a bit damp. The motorhome has two main sources of power, the 12volt electrical supply and propane/butane gas. The gas supply provides us with hot water, heating, hob and oven and (possibly surprisingly) it also powers the fridge freezer – the 12volt electrical supply just isn’t powerful enough unless the engine is running. We obviously want the fridge freezer to run all of the time, otherwise we could be in a food poisoning inducing situation with our food freezing and then defrosting; the fridge freezer in the motorhome is designed to ensure that this doesn’t happen and will (with occasional encouragement) switch between power sources. When we are travelling our fridge is powered via the starter battery, when we stop the engine it should automatically switch over to gas and if we are on electric hook up it should use the 230volt electricity supply as a priority. This means that we have power to the fridge all of the time – until we run out of gas. We had noticed that the fridge’s automatic switch between power supplies was being a bit temperamental. It would sometimes need a bit of help (turning off and on again – the standard IT practice for any equipment that doesn’t work) to switch to gas after the engine had been running. Also it had not been switching onto the 230volt supply when we were on hookup and again needed some encouragement – this time by turning off the gas supply to force it to consider other options. Because of the latter we had used more gas than expected. And because the gauges that come as standard on gas bottles are notoriously unreliable we weren’t really sure how much gas we had used. When we reached our parking spot the fridge was refusing to work on gas, we could hear the constant ticking of the ignition, but the little red LED kept flashing. So that was it, we decided to go and top up the gas. 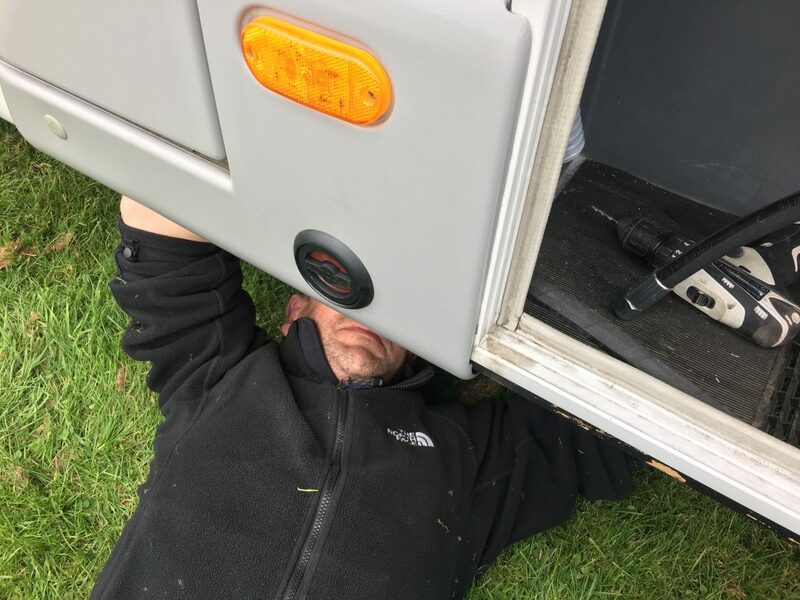 We have opted for a refillable gas system in our van, which Paul has installed, with two 11kg bottles that should hold about 40 litres of LPG. We went for GAS IT, one of a few popular providers of cylinders, tanks and other fittings. This replaced the standard set up of CALOR gas bottles which have to be exchanged at a supplier. Installation was relatively straightforward with the main issue being working out how to fit the bottles and connecting pipes into the small space without any kinks. We now have an external fill point (much easier than opening the hatch each time) from which we can fill both bottles. The idea of a refillable system is to save money, allow us to carry more gas, and (when abroad) to more conveniently top up as CALOR is not often found overseas and foreign exchangeable gas bottles need different fittings. Financially this option works for our long term touring situation where we are often wild camping and so using gas rather than electric. We should be able to go to any Autogas pump and fill up at about 57p a litre (current UK prices). A normal 6kg CALOR bottle should hold about 11.5 litres of gas which would cost £6.56 at the pump, yet 6kg CALOR bottles are about £23 to exchange. With our initial outlay of £320, we should see payback after about 200 litres of gas, or 300 litres assuming we switched to the more economic 13kg CALOR bottles. If we carry on using gas the rate we have been then we’ll be breaking even before a year is up – we’re keeping track and will let you know. So off we went to find a filling station with LPG, but of course it’s not found everywhere. After a failed attempt at a Texaco garage we were directed to the town of Llandysul where we found a gas supplier hidden behind a fruit and veg warehouse. The myLPG.eu app comes in useful, but seemingly isn’t always up to date. When we’d finally managed to fill up (including a lesson on resetting the pump from a very helpful chap at West Wales Gas) we returned to our parking spot. This wasn’t the best place we have stayed. There was a couple who went for a walk and then got up to something very steam inducing in their car, and a lad who obviously felt we had taken up his donut-ing arena and was reduced to a few handbrake turns and some very loud revving before he got bored and left us to a bit of peace and quiet for the rest of the evening. It’s a real learning curve! I now realise how cushy life is on Caravan and Motorhome Club sites albeit much more expensive. OK for a few weeks a year but too costly for the long haul. I also think that the club sites are over priced for what they offer and smaller private sites often offer better value, better service and better locations. The main advantage of the clubs is their CS or CL locations. That said we still haven’t found the perfect campsite whether they are club sites, private sites or wild camping spots. Each has it’s own advantages and disadvantages, and of course that can depend on our mood at the time – and the weather.